The 815 Robotic Soliprep for LC enables users to homogenize, extract, dilute and filter solid or liquid samples. Subsequently, the sample is transferred directly to an IC or HPLC system by way of a connector. Depending on the requirements of the application, the 815 Robotic Soliprep offers enormous flexibility in the configuration of the system and integrates all sample preparation steps into a single, continuous and fully automated analytical sequence. To this end there is a selection of sample racks available, which can be equipped with various inserts. Hands-free homogenization, filtration and dilution--as well as sample transfer to your instrument--for up to 10 samples at a time! As with the Soliprep-Filtration system, Soliprep-LC accurately and automatically adds organic solvents or aqueous reagents via Metrohm's unique Dosino® dispensing technology, and it uses the attached KINEMATICA POLYTRON PT 1300D homogenizer to reduce sample particle size. After homogenization, Soliprep automatically cleans the homogenizer, while at the same time aspirating a sample aliquot via syringe and then filtering it into an 11 ml vessel via a syringe filter. With Soliprep-LC, the filtrate can now be pipetted directly or after additional dilution into an IC, LC, or HPLC. Soliprep automatically changes the syringe needle and filter after each sample step and drops the used consumables into its attached waste container. To ensure a thorough cleaning, the attached Metrohm 772 Pump Unit aspirates any remaining solid particles. 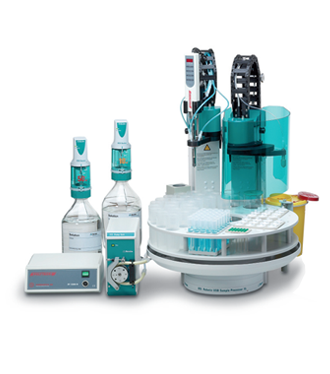 All Soliprep models include the KINEMATICA POLYTRON 1300D homogenizer, beakers, and intuitive Metrohm Tiamo® software for flexible control and easy data management. In the first step, solvent is added and the sample homogenized. After that, sample is drawn up with a metal-free needle, filtered and finally transferred directly to the IC system by way of a connection port.